Traditionally, the White House was interested in using sanctions against Cuba to increase the opposition sentiment of the local society and restore the market economy on the island. The US repeatedly demanded that the Cuban authorities give freedom to political prisoners. US anti-regulation sanctions prohibit US firms from importing anything into the island, except food and medicine, both from the US and from third countries. Firms from third countries are prohibited from exporting Cuban products or Cuban components to the US. There are migration restrictions. Cuban accounts in American banks are frozen. According to the Helms-Burton Act of 1996, foreign ships carrying products from Cuba or to Cuba are prohibited from entering US ports. Due to the policy of the Cuban communists, American business lost $ 1 billion of direct investment, about 2 million hectares of agricultural land, 3 oil refineries and 36 sugar plants, and a large number of commercial and industrial enterprises. Before unseating regime of President Fulgencio Batista, the island's economy was largely tied to the United States. American firms owned the most fertile land, controlled banks, financial system, electricity generation, nickel production (third in the world), cobalt, manganese and iron ore and other minerals. About 90% of Cuba's sugar and tobacco exports were absorbed by the US market. During the years of the Cold War, Cuba was able to reorient part of its exports to the countries of the socialist bloc and enjoyed financial assistance from the Soviet Union. After 1991, the island's authorities concentrated on creating a multistructure economy, developing tourism, the service sector and conducting partial privatization. In 2015, Cuba's GDP was $ 87.13 billion, 58% of which are services, including tourism, 34% - construction and industry, and 5% is agriculture. Sanctions hinder the development of Cuba, reduce its investment attractiveness. A significant portion of foreign investors do not want to spoil relations with the United States. During the 50 years of the US embargo, Cuban economy lost $ 130.2 billion, and $ 822.3 billion from other sanctions. Cuban business card was worn cars and urban transport. US former President Barack Obama Certain made some steps towards the Cubans. In 2009-2016, the White House allowed American citizens to visit relatives in Cuba more than once a year, allowed students and missionaries to come to the island. The United States began to issue multiple visas to citizens of Cuba. In 2016, Barack Obama restored diplomatic relations with Cuba. Last year, the States and Israel for the first time in history abstained from voting on a resolution to lift the embargo. Establishing relations with Cuba was part of the foreign policy strategy of the administration of the Democrats. Obama wanted to restore US confidence in Latin America. During the reign of George W. Bush, anti-American sentiment grew there. In Brazil, Argentina and a number of other countries, left-wing politicians came to power, who were inclined to an alliance with Russia and China. In the 2000s, focusing on military operations in Afghanistan and Iraq, the Bush administration did not provide financial and economic assistance to the countries of the region in dealing with the consequences of the economic crisis. Havana has a special authority among the left-wing politicians of Latin America. They consider Cuba an "island of freedom," an example of a state that could get out of the US influence. Washington has repeatedly been criticized for the policy of sanctions against Cuba. The logic of Obama was to establish relations with Cuba, to demonstrate to other countries in the region the possibility of cooperation with the United States. Republican President Donald Trump does not share his predecessor's approach to Cuba. He believes that Obama was wrong about Cuba and went on a terrible deal with the government, which spreads violence and instability in the region. In June, Trump annulled Obama's decision to allow Cubans who fled to the United States to request a residence permit within a year. In September, the lord of the Oval Office extended the embargo against Cuba for another year. Trump stressed that the US sanctions against Cuba will remain in effect until the current government of the island releases political prisoners. It seems that Trump deliberately uses the theme of political repression and acoustic attacks in order to freeze contacts with Cuba. The normalization of trade and economic relations with the island and the liberalization of the migration regime for Cubans are contrary to the policy of protectionism of Trump. In the framework of "Make America great again" policy, Donald Trump intends to protect the interests of American manufacturers, to promote the emergence of new jobs in the US and the employment of American citizens. 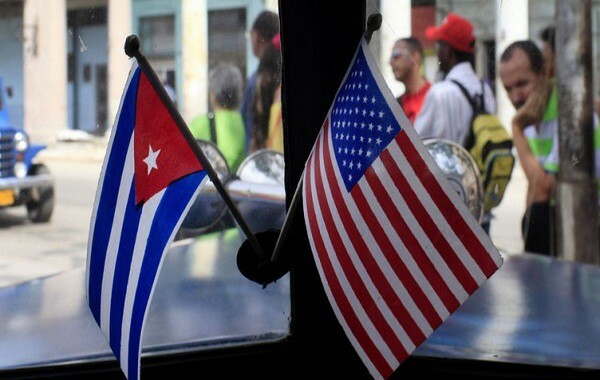 Cuban refugees, whom Barack Obama allowed to apply for a residence permit in the US, are potential competitors for American citizens in the labor market. In 2016, more than 56.4 thousand Cubans arrived in the US by sea, which is 31% more than in 2015. Cuba, as well as other Latin American countries, is taken as a potential labor exporter. It is no accident that the American president supports the idea of building a wall on the border with Mexico in order to reduce the influx of illegal migrants. Trump uses any reason to take new measures to reduce migration to the United States. Trump is not interested in using Cuba as a bridge to revive trust among leftist politicians in Latin America, as Barack Obama did. He considers it unnecessary. In Argentina and Brazil, right-wing centrists came to power, and the socialist Venezuela is burning in the flames of civil confrontation. Venezuelan President Nicolas Maduro is disgraced by the majority of the countries in the Western Hemisphere. Trump is not interested in the idea of creating a Pan-American free trade zone, which in the 2000s was promoted by former President George W. Bush. If Trump has broken the agreement on trans-Pacific partnership with the APR countries and refused to conclude an agreement on a transatlantic trade and investment partnership with the European Union, it is unlikely that he is ready to give preferences for producers from Cuba and other Latin American countries. With the extension of the embargo against Cuba, Trump tries to kill two birds with one stone. He wants to improve his reputation in the US Congress and to restrain Russia's presence in the Western Hemisphere. Cuba is one of the issues on which the US president and influential members of Congress from the Republican Party have the same points of view. Attempts by Barack Obama to convince US lawmakers to lift the embargo against Cuba did not succeed. Republican senator Bob Corker allowed the possibility of lifting the anti-Cuban sanctions only in the event of a change in Havana's behavior and changes in the country. In his opinion, serious human rights violations continue in Cuba. Ted Cruz and Marco Rubio, Senate Republicans of Cuban origin, are against the lifting of the embargo. Trump's tough stance on Cuba will raise his reputation in the eyes of party members who did not share the president's initial views on normalizing relations with Russia, stopping funding for NATO, and supporting an investigation into possible Kremlin intervention in the 2016 presidential election. Cuban leadership conducts cooperation with Russia. In early October, the Russian oil company Rosneft and the leadership of Cuba discussed the possibility of increasing oil supplies to the island, implementing joint projects in the extractive industry, and cooperation in the modernization of the Cienfuegos oil refinery. In March, Rosneft and the Cuban company Cubametales signed an agreement to supply 250,000 tons of oil and diesel fuel. Earlier, Cuba bought oil from Venezuela at preferential prices as part of the Petrocaribe program. In connection with the financial and economic crisis and political instability, Venezuela can no longer supply cheap oil. Russia is interested in developing oil production in the Cuban deposits. Reserves of oil on the shelf of Cuba are 5 billion barrels, and 300 million cubic meters natural gas. Since 2011, the Russian firm Zarubezhneft has been carrying out work to improve oil recovery at the Boca de Haruko field. In the same year, Gazprom Neft was included into the project of the Malaysian company Petronas to conduct exploration work on four blocks located in the Cuban exclusive economic zone on the shelf of the Gulf of Mexico. In 2015, a contract was signed for the construction of seven power units by Russian specialists at two Cuban thermal power plants. Russia supplies cars, equipment, vehicles and chemical products to Cuba. Russian press regularly states about the possible resumption of the work of the electronic intelligence center in Lourdes, which was abandoned in 2002. This facility allowed Russia to intercept data from US communications satellites, terrestrial telecommunications cables, messages from the US Mission Control Center of NASA in Florida. According to Izvestia (Russian newspaper), State Duma deputies are convinced that the resumption of the work of this facility will become a "cold shower" for the United States, which allegedly conduct an "aggressive" policy towards Russia. Despite the fact that the Cold War times have long ago disappeared, the Russian leadership is looking for different pretexts to gain a foothold in Cuba. Russia has no more acceptable partners in Latin America. Venezuela is destabilized, and Nicaragua has no significant political influence in the region. Donald Trump will exert pressure on Cuba and possibly tighten restrictive measures if Russia's influence on the island grows.